New Orleans is a drummer’s town. 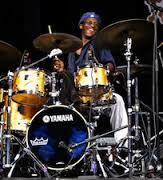 But in this town full of first class drummers, Herlin Riley is “the” drummer. The Baron of the Boom Boom. The Pulse that keeps the life flowing through any body of work. Born into a musical family steeped in gospel, blues and jazz, Herlin is the answer to the question, what is New Orleans? After playing with everybody who was anybody in this music scene, Wynton Marsalis asked him to join him in New York in 1988 where he stayed for almost two decades while still maintaining a home in New Orleans. He still is a regularly featured musician with the Jazz at Lincoln Center Orchestra but now is back in his home town when he’s not on tour with Ahmad Jamal, Dr. John, or Harry Connick, Jr. He lights up a stage with just his presence and always fires up the first class jazz artists who love to play with him.